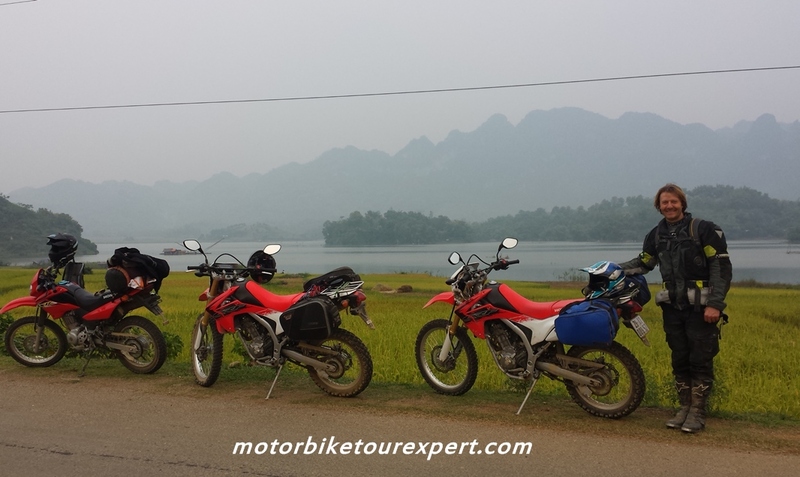 It’s one of our popular motorcycle tours northern Vietnam. It is only 8 day motorbike ride but you can see the highlights of northeast and northwest Vietnam especially Sa Pa and Ha Giang – the Karst plateau and Global Geopark. 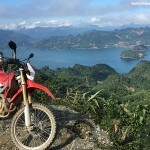 They are two famous and amazingly scenic places located in North Vietnam which can offer both on and off-road ride. Besides, the tour offer a lot of interesting Visits to different colorful hill tribes. This is always the one in our best collections of Vietnam motorcycle tours. Day 1: Hanoi Motorcycle Tour to Phu Yen: 170 km. Start this amazing motorbike tour in north Vietnam with a short ride to Phu Yen – a peaceful town in the green valley of Son La province. We take the bike from the western outskirt of Hanoi, strive to be on a quiet and small road as long as possible to get away from busy traffic. After 2 hour riding, we will be right in mountain area with countryside back roads between green rice and tea field . Lunch is in little town Thu Cuc after passing small corner of Ba Vi National Park. We arrive Phu Yen town at about 4.30 PM. Get the room and enjoy a short walk around peaceful town or take another easy motorcycle ride to some rustic villages nearby the town. Day 2: Phu Yen – Than Uyen: 210 km. We keep motorcycle touring up to North Vietnam. It’s quite long ride with a lot of picturesque stops and many interesting things to see on the way so the tour should start at 8.AM. Right after the town we will be on the winding and beautiful Lung Lo pass and then hit the quiet road to Tu Le – a charming little town where we have lunch. The second half of the day could be best motorbike ride in Vietnam. After 50km from where we have lunch, will be in Mu Cang Chai in which we have great chance to take pictures of the most beautiful terrace fields in northern Vietnam. Arrive Than Uyen at about 5.PM. Dinner and stay in Hotel – Than Uyen. Day 3: Than Uyen Motorcycle Tour to Sa Pa. 100 km. The short Vietnam motorbike trip to Sa Pa today is the highlight of the tour. The first half of the day, we will enjoy an easy motorbike ride on the smooth road with beautiful tea fields and the colorful hill tribes along the way. And the other half, we ride on Qui Ho pass to cross Hoang Lien mountain range- the highest one in Vietnam including Fanxipan peak with the height of 3142 meters above sea level. It’s sure that you will have pictures of the most beautiful valley in north Vietnam. We will be in Sa Pa at lunch time. After luch in Sa Pa town, we have half day to discover lovely town in cloud – Sa Pa by walking or having a short Sapa motorbike ride along the Muong Hoa valley . Diner and Overnight in Hotel – Sa Pa.
Day 4 : Sapa – Ha Giang. 200 km. 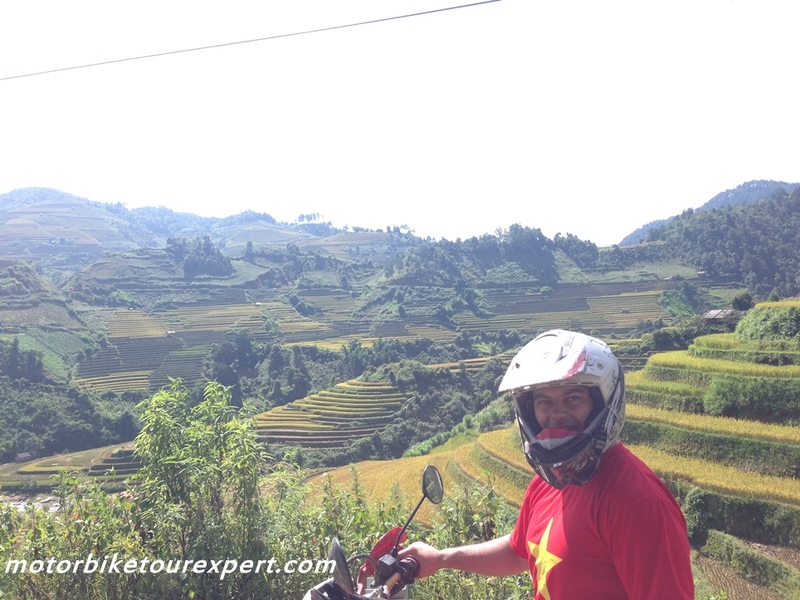 Start the enjoyable Vietnam motorbike tour to Ha Giang at about 8.30 Am. After breakfast, we will hit the road down to Lao Cai town – 40 km from Sa Pa. We can take many breathtaking pictures from the height of around 1.500 m above sea level. Take a café stop at Nam Thi River bank – the river is also the border between Vietnam and China. After that, we keep riding down on the winding road No 70. Lunch is in Pho Rang town. Then motorcycle up again to Ha Giang. We will finish this good motorbike tour to Ha Giang in a beautiful and peaceful village of the Tay – 3 km from Ha Giang City. Day 5: Ha Giang – Dong Van. 150 km. The ride today is one of the best motorbike tour in north Vietnam. We will be in the center of the Dong Van Karst Plateau Global Geopark. After getting out of Ha Giang city, we will ride motorbike slowly on the winding, “up and down” roads along the Karst Plateau, enjoying incredibly beautiful scenery, doing some stop to visit the colorful and happy people live long the road. Especially, after lunch we can take a visit to Palace of the H’mong’s king to learn more about the Indochina War and the life of the local people during the war time. 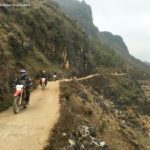 This motorbike ride to Dong Van Rock Plateau is always the highlight of North Vietnam motorcycle tours. Arrive Dong Van at 5 PM. Overnight in Hotel. Day 6: Dong Van – Bao Lac. 120 Km. After breakfast, we will take a short trek to the top of the hill about 1 km from the hotel. The hill was used as a Fortress of the French where we can have best view of Dong Van Town. Back to the hotel, get the bikes and keep enjoy beautiful mountain Vietnam motorbike touring. Today we have chance to ride motorbike on Ma-Pi-Leng pass –one of 4 most beautiful passes in northern Vietnam. Lunch is in Meo Vac town, then motorbike down all the way to Bao Lac. Overnight in Hotel – Bao Lac town. This is the short but great motorbike tour to Ba Be. Right after the town we will take a small road to Son Lo village. The road is up and down , small and almost empty but the mountain view somewhere is amazing. Especially, we have a chance to do some offroad ride to cross some small streams. We will be in Pac Ngoi village at about 1 PM. Lunch is with the local people. after lunch we spend the rest time of the day for the boat ride on Ba Be lake. Home stay in Pac Ngoi – village of Tay people. Ba Bể Lake (Vietnamese: Hồ Ba Bể, Ba Bể meaning “Three Lakes” in the local Tay language) is the largest natural fresh water lake, stretching about 8 kilometers in the north-south direction. The surface area of the lake fluctuates between 3 and 5 km² between dry and wet season. Unlike many lakes in Karst limestone areas, Ba Bê Lake never falls dry. Its average depth varies between 17 and 23 meters, the maximum depth is 35 meters. The lake lies about 150 meters above sea level, making it also Vietnam’s highest. The name “Three Lakes” refers to the three parts of the lake named Pe Leng, Pe Lu, and Pe Lam. All these three parts are connected into a single continuous body of water, however. The Ta Han, Bo Lu, and Leng Rivers feed into the lake from the south and the west. During the dry season, water is drained from the lake northwards into the Nang River. During high floods in the wet season, the latter flow is reversed however, and the lake takes up water from the Nang River thereby acting as a buffer regulating flooding. Day 8 : Ba Be – Hanoi. 240 km. End the great northern Vietnam motorbike tour by taking a big motorcycle ride back to Hanoi. After early breakfast, we will try to be off the big and busy road as long as possible. Unlike the motorbike tour in days before, the tour today is in much busier traffic but in different way we will find something interesting. Arrive Hotel in Hanoi before rush hours . Tour ends!